In 2013, El Paso, Texas took the sacrifices cities make in building sports facilities to new symbolic heights when it demolished its 34-year-old city hall in order to clear the land for a new minor league baseball stadium. El Paso committed to the project, not for the love of the game, but in order to anchor their downtown redevelopment, which included 85 projects receiving nearly $500 million in total from municipal bonds. Cities have been viewing major league sports facilities as urban redevelopment magnates for thirty years and increasingly, small-to-mid-size cities like El Paso have begun to view minor league baseball stadiums in a similar light. Since the publication of Arthur Johnson’s book Minor League Baseball and Local Economic Development in 1995, eighty-three minor league baseball stadiums have been built in the United States at a total cost of over $1 billion. However, city employees are not normally the ones being displaced by major redevelopment projects. Large-scale public-private partnerships are often protested not just because of the question of the efficiency of government investments but due to their disproportionate impact on the disadvantaged and underprivileged. If a project is successful at revitalizing the neighborhood, it could mean rising rents, displacement, and change to a neighborhoods character. Both the positive and negative aspects of urban redevelopment are worth evaluating for public-private partnerships. 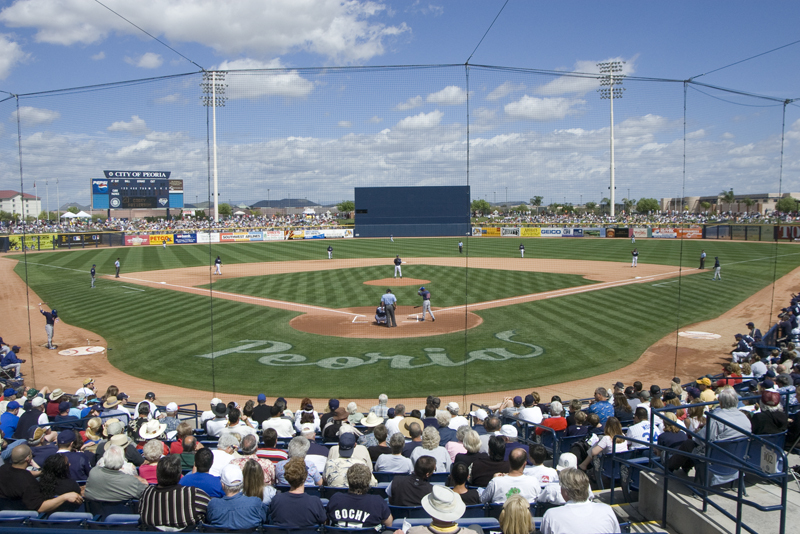 Over 200 cities across America play host to minor league baseball, creating a sizeable set of stadium projects to study. Specifically, I analyze twenty-four stadiums opened around the 2000 census in order to analyze aspects of both redevelopment and gentrification in the nearby neighborhoods. I consider census tracts within one mile of the stadium as being “treated” by the project, and I then compare the change in those neighborhoods against census tracts throughout the rest of the host cities. In order to track changes both in urban redevelopment and gentrification, I utilize four measures: the percentage change in median rents, the percentage change in median income, the change in the percentage of residents living in the neighborhood for ten years or longer, and the change in the percentage of minorities. Neighborhoods immediately surrounding minor league baseball stadiums did change as a result of the projects, though not in a traditional way that gentrification would dictate. In particular, the change in rents near and away from the stadium was not statistically different, and the lack of an effect on area rents helps to explain why there were not large differences in the rate of turnover in the neighborhoods. With housings costs not increasing, we have less reason to expect displacement to occur. Rather than being pushed out, long-time residents may have new reasons to stay in the neighborhood as the stadium, and potentially nearby ancillary businesses, open. Near the stadium, median incomes increased by 8.5%, and those gains were not solely driven by an influx of new residents to the area. When changes in the education level in the community are controlled for along with the change in the proportion of residents that work in professional occupations, the significant effect of the stadium on income remains. Thus, the neighborhoods change in income is not entirely related to outsiders moving in, but that growth in income also is being driven by those without college educations increasing their earnings. While that is one interpretation of the results, the data did not allow for a direct test of whether or what type of jobs were introduced to the neighborhoods after the stadiums opened. Changes in the racial composition around the stadiums tell a more troubling story. There was a significant difference between the change in the minority populations in the area near the stadium and the rest of the cities; throughout the sample the proportion of minorities grew, but significantly slower near the ballpark. I cannot explain exactly why minorities did not locate near the new project, but it may be that minorities were disinterested in the new amenity, or were pushed out by others seeking access to the jobs beginning to become available. The disclaimer still applies that cities must evaluate whether there were better uses of their scarce funds to grow their city’s economy, but minor league stadiums can have an effect on urban redevelopment. The growth in income could help cities to justify further investments in minor or major league facilities, but it should be stated that the cities did not grow as a whole after the stadiums opened. Cities have struggled for decades to redevelop their downtowns, but these projects did so partially at the determent of other neighborhoods by concentrating redevelopment activities in chosen neighborhoods. Just as importantly, there is not conclusive evidence that the character of neighborhoods change or that groups face high rates of displacement after the stadium is opened, though the result for minorities should draw caution. Eric Joseph van Holm is a Ph.D. candidate in the joint doctoral program in public policy at Georgia State University and Georgia Institute of Technology. His research interests include economic development in mid-sized cities, neighborhood change, and entrepreneurship.